Dodging hurricanes, searched for by the Coast Guard, and plagued by engine trouble, Dave Tripiciano was lost and aground several times as he made his way up the coast of America in his twenty-five foot sailboat "God Speed". Surviving life threatening situations, he met and touched the lives of many people along the way. 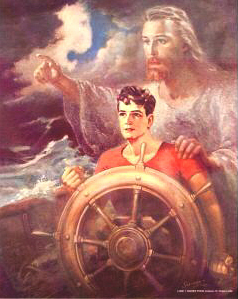 "Voyage of the Heart" is the true story of his amazing adventure, and a powerful testimony to the reality of God and His hand of protection and blessing. I Wanted To Tell You What A Tremendously Uplifting And Gripping Book This Was! It Became Somewhat Of A Devotional For Me. Each Morning Before Work I Read Another Chapter, Eager To See What Adventures You Would Have That Day. Your Testimony In This Book Has Inspired My Walk In Many Ways: My Prayer Life, My Courage To Witness And My Understanding Of What An Intimate Part Of Our Lives God Really Is. I Want To Thank You From The Bottom Of My Heart For Touching My Life With This Book! 10. Bold Adventurer Or Aging Fool? 29. "Big Waves Sink Small Sailboat On The Chesapeake"
Hand signed, personalized copies of this unique 392-page book are now available directly from the author! Own a hand autographed copy - personalized by the author with your name and the date. Thirty-seven full page photographs (taken by the author) set the scene for each chapter, as you travel with him, sharing his thoughts and experiences on this amazing adventure. This amazing true story is also available on Audio Tape or CD. Hear the excitement, fear, and joy in his voice as he faces life-threatening situations and triumphant moments. The comic relief is sure to bring a smile to your face, as he assumes the voices of other individuals he encounters and imaginary characters he creates. This dramatic reading of the book by the author brings the adventure to life, as relaxing background music creates a nautical mood. NOTE: At this time the printed version of the book is available only as a Paperback.